Note: This post was submitted to Essex County Place by the World Mission Society. Newark, New Jersey: Over 40 members of the World Mission Society Church of God offered their time, energy and support of the recent Care of the Park Movement with Branch Brook Park Alliance. The volunteers vigorously and enthusiastically weeded invasive plants, cleared debris and collected trash and recyclables from various areas throughout the park. 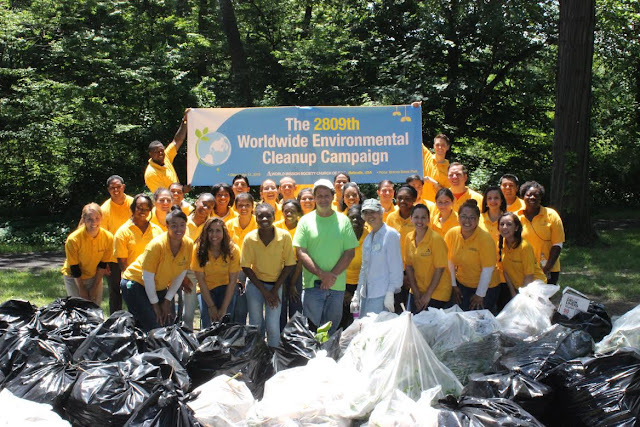 Working together with trained gardeners and arborists, the members of the World Mission Society Church of God branch located in Belleville, NJ were able to collect over 30 bags of debris and trash along the Lenape Trail. The park, which is over two miles of trails, fields, trees and ponds, is a treasure within Essex County and its landscape and history are well-worth the effort to preserve resources there. The County along with Branch Brook Park rely on volunteers such as the members of the World Mission Society Church of God to advance the Care of the Park Movement so that this park is well-cared for and protected. The volunteers’ hope is to push this new movement forward so that it may grow in size and strength and more of our neighbors will join in caring for this public treasure.